You are here: Home / Adam in the Media / Adam Lambert – New Music Next Week!! Just announced this morning, Adam Lambert tweeted that new music is coming June 30th! The song is called TWOFUX. However, he debuted it tonight at the Jimmy Kimmel Concert Series! 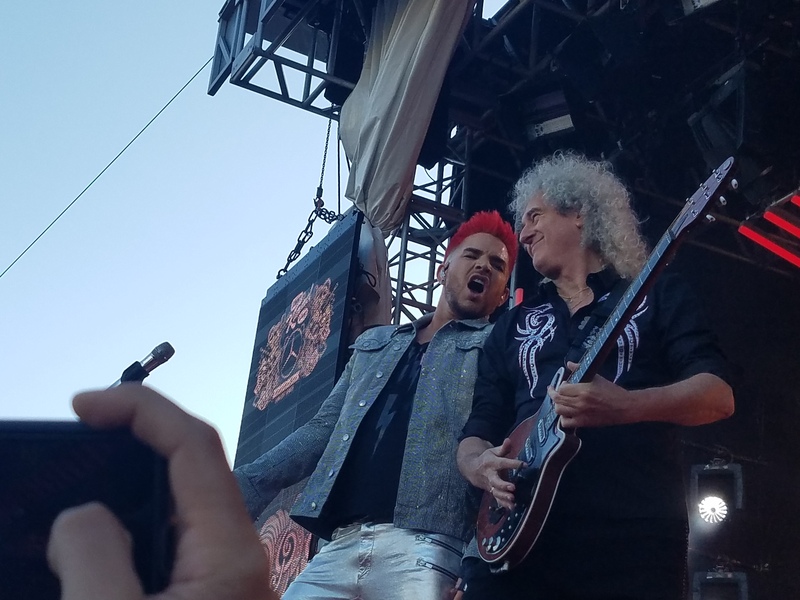 Here it is, with Queen accompanying him! What do you think? It’s so exciting to see what new direction Adam is going! Let us know your thoughts on this! Also announced by one unverified website is that he will be joining the new American Idol judging panel. If so, Adam will be joining Katy Perry and another unnamed judge on the panel that started it all for him. Again, this has not been verified. Okay, I gotta run – Lila and I are on our way to Los Angeles for the Jimmy Kimmel Queeen + Adam Lambert concert tonight! The second judge for ABC’s ‘American Idol’ reboot is now known, and POB can be the FIRST to exclusively report that it’s none other than Adam Lambert! The eighth season runner-up joins Katy Perry at the judges table, while the third (and presumably final) judge has yet to be announced – though recent rumours have suggested it may be Chris Daughtry despite the fact that he denied being contacted by show execs. Lionel Richie is another name being floated around. Ryan Seacrest is also set to sign a lucrative multi-million deal which would see him returning as the show’s host – a perfect move considering he’s already with ABC, co-hosting ‘Live’ alongside Kelly Ripa. 16th-season ‘Idol’ auditions are set to kick off on August 17th in Portland and will conclude on September 14th in New Orleans. I wasn’t going to watch it because I do not care for Katie Perry, but I will definitely watch it if Adam is on. I will watch it now. I fear if the ratings are bad he’ll get the blame and if they’re good, Katy will get the credit but I’ll watch. Putting Lionel Ritchie on there might be a great idea. Is that a joke that his song is called Twofux? Are you kidding me? What is wrong with him? This is terrible. I am very disappointed. Not much more to say. You can’t tell me people will be ok with this. IDOL might even drop him. Who is guiding him? I am hoping to see more of him on film and movies….I”d luv to see his performance in a musical comedy or some type of arrangement in which he is singing in a movie. This would be a good move. Anything he sings I luv to listen to and would luv to listen to. People who make a positive difference is whom I applaud! I got to watch Adam thanks to you Carol. Just in time to tape it. Thanks again for sharing Carol. Too bad I had to sit through Jimmy Kimmel though. I ABSOLUTELY LOVE Adam…I have ALL his music. I would watch him sing the phone book in slow motion…but this song is average at best & will NOT appeal to the masses. I’m sorry to say….I too am disappointed. I keep hoping for that “Break out” song that will knock peoples socks off. This is not it! Also the title of the song is not a good choice. I have no problem with it…but many will. In order for him to really be a top music artist & contender, he NEEDS to get radio time…which in this day & age is HUGELY IMPORTANT! Which means he needs some new AMAZING material!! When he was singing on AI finally’s…he got my blood pumping. I kept saying he was going to be the next George Michael or male Madonna…I’m sorry to say…so far it isn’t happening! WTF??? He deserves it. I will continue to admire, lust & idolize & buy his music….but also pray for that break out moment. I can’t believe I just said that about my “BELOVED Adam”! What is wrong with me? I *so* agree with this. Outstanding as usual – so glad we have our Adam and Queen too. I always remember dialing for 4 hrs for Adam. Now he is the winner. Such great kind person. Hopefully I’ll get introduced to meet him one day. My Buddy MacBoy married his buddy and moved to CA but I have a new buddy that says he also know Adam so maybe one day. My new buddy does hair at the mall so – he will be sharing all my Adam music treats I used to give to MacBoy and his buddies. I love our Adam and also buy all his music, pictures, books and CD. Hope he gets to judge on AM again. I would love to see Adam weekly again. God Bless you Carol and for tending to Adam and sharing for the world to see such a great kind person. Keep going. See you all soon. I was upset too when I first heard it – cute, catchy, all Adam, yet unplayable on the radio – WTF Adam. It has since been pointed out to me that Adam has made his music “PG” for a while now and what good has it done him. And I was enlightened. Why do we love him? Because he’s fearless. And himself. I think maybe we project what WE want for him too much. Maybe “radio success” is an outdated concept anyway. Lots of other ways to sell songs nowdays. Maybe it’s just a one-off for fun. MAYBE MAYBE MAYBE. Do you remember his answer when asked what he most wanted in the music industry long ago? He said longevity. Not the top 40 chart (which is crap now anyway), not big hits, longevity. I’ve never forgotten that. I went to the Glendale show (ruined by lasers) and the Las Vegas show (perfection) and enthusiastically sang TwoFux – quite a sing-along in Vegas by the way. If it’s good enough for Brian May and Roger Taylor to have it sung and dedicated to Freddie Mercury it’s good enough for me. Live your wonderful life Adam, be well and happy. The rest is nonsense.